Update #2. Posted 1300hrs on Friday 30th November, 2018. Decision B has been made. Expanded information below reconfirms what Decision B means FOR ALL ENTRANTS in this years event. – Friday registration will take place as planned 3.30pm to 9.00pm at the Powderhorn in Ohakune. – Saturday registration. The only option is the Powderhorn, Ohakune from 6.00am through to 7.30am. THERE IS NO REGISTRATION AT BRUCE ROAD, AS THE CONTINGENCY COURSE DOES NOT GO TO THE BRUCE ROAD SIDE OF THE MOUNTAIN. – No pre event bus transport required (those who had booked transport in Ohakune simply walk to the start area near the bottom of Ohakune Mountain Road). – Post event transport down the mountain remains the same. 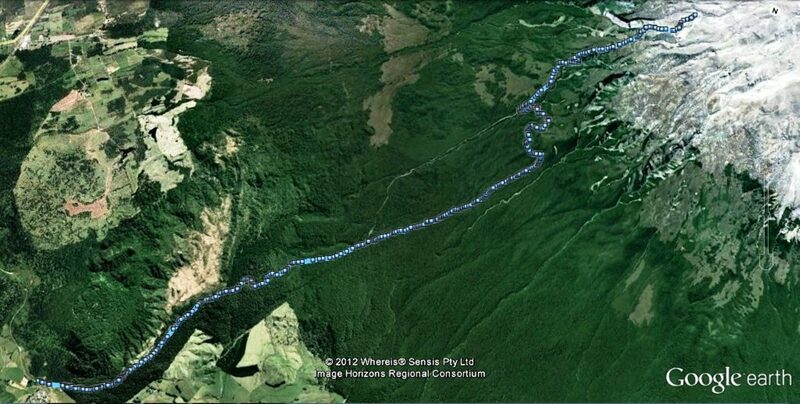 – The gear bus will be parked near the bottom of the Ohakune Mountain Road (on Railway Row) near the start area. After all of the wave starts the bus will transport all entrant gear to the top of the mountain to be placed inside the café for collection. – There are NO changes to the compulsory gear requirements. – The start line is near the bottom of Ohakune Mountain Road. The contingency course utilises 45% track / 55% road and includes both the Mangawhero Trail and the Blyth Track (on the right hand side of the Ohakune Mountain Road). It is the same contingency course that was staged in 2012. – All support vehicles will need to begin travelling all the way to the top of the Ohakune Mountain Road pre 7.30am (well ahead of wave 1). Support vehicles are not permitted to stop in the carparks near the track entry and exit points – they need to be parked in the Turoa Skifield carpark area (at the very top of Ohakune Mountain Road) pre 8.00am. Should your supporter not want to come up the mountain that early, or should your supporter not want to stay up the top of the mountain to watch you come in, the event will transport every entrant down the mountain if required (regardless of pre paid bus transport ticket or not). Entrants will be dropped off outside the Powderhorn, Ohakune. * A compulsory Race Briefing will be held at 7.40am intersection of Railway Row and Ohakune Mountain Road. – Course cut-off time is 12.30pm. – Post event BBQ, goat beer plus goat sausage & recovery area all remain the same. – Post event dinner timelines remain the same. – Post event party timelines remain the same. All further queries will be handled by our team at event registration from 3.30pm today. Again, please share this info with all of the people you know who are participating in the event. As we are in countdown mode to the event, the Goat website and Facebook page are your source of information from this point onwards. Emails will not be responded to. Course Profile and Map below. FIRST UPDATE: Posted here 7.30pm Thursday November 29th. Our staff and Safety Management team have been carefully monitoring the weather for the last 10 days. As we draw ever closer to the event we want to lay out very clear information on what may take place over Goat weekend, prior to travelling to the event. Please carefully read the following. 1. This webpage will be our primary information page for weather and contingency updates from here on in. 2. The forecast weather information from several reliable sources currently indicates that both Saturday and Sunday are not favourable. You should be packing the best possible gear (windproof layers and wet weather gear) you have for the weekend; your lightest weight race gear is not likely to be appropriate. Once you think you’ve finished packing, pack more. If you’re tossing up which jacket to bring – bring both; your most insulated weatherproof jacket is recommended. 3. There are a number of weather related factors that may not see the prescribed courses get underway as planned at 0730hrs and 0930hrs respectively on Saturday. Please read on for details on what decisions might be made, when they might be made and what impact that might have on you. First off, why do we have contingencies in place for this event? This event is held in a fast changing alpine environment. We absolutely need contingencies in place and we have had these in place since year 1 of the event. In our 15 year history we have implemented contingencies once. Who makes any decisions around implementation of contingencies? Decisions regarding implementation of one of the contingency plans will be made by a Contingency Management Committee comprising our lead Safety Manager from Peak Safety (our mountain safety experts), our Course Director, Event Director and Event Manager. This group is able to consult with a wide range of experts including personnel within the Department of Conservation, GNS Science, Ruapehu Alpine Rescue Organisation, LandSAR, NZ Police, & Ruapehu Alpine Lifts. What weather factors are considered by the Contingency Management Committee? Consideration will be given to a wide range of factors not limited to; the rain volumes, river levels, river flow, wind speed, predicted temperatures (particularly wind chill), visibility, ability to fly for helicopter extractions, sleet/snow, thunderstorm activity, potential road closures, volcanic alert levels, start/finish line shelter and infrastructure as well as marshal, staff and supplier safety. Any decision is final and will be made in the interest of safety. Next update – will be posted here at 1400hrs on Friday 30th November. Ok so what decisions might be made at the next update? Decision A, B or C will be made. A. The prescribed courses (both Goat Tongariro and Big Kid) will continue to be staged as planned on event day. B. ** The prescribed courses (both Goat Tongariro and Big Kid) will not to be staged as planned on event day but the contingency course for all entrants will instead be staged on event day. C. The prescribed courses (both Goat Tongariro and Big Kid) will not be staged as planned on event day. The event is postponed until Sunday. What does each decision mean for me? Nothing. The event will continue to be staged as planned. – Saturday registration. The only option is the Powderhorn from 6.00am through to 7.30am. – Post event transport remains the same. – The start line is near the bottom of Ohakune Mountain Road. It utilises 45% track / 55% road and includes both the Mangawhero Trail and the Blyth Track (on the right hand side of the Ohakune Mountain Road). It is the same contingency course that was staged in 2012. – All support vehicles will need to begin travelling all the way to the top of the Ohakune Mountain Road pre 7.30am. There will be no event staged on Saturday. – There will still be a Saturday morning registration at the Powderhorn from 6.00am through to 7.30am. – An email confirming what event course will be run on Sunday (prescribed courses or contingency course) will be sent out when further information is available. – This page will be updated when further information is available. Updates will also be made to the Goat NZ Facebook page. In the interim safe travels to the event! Please share this info with all of the people you know who are participating in the event.